Recently I went on vacation to San Antonio Texas to visit with my fiancée's family. While there, one of the things I wanted to do was check out any retro game stores that might be there, as there really aren't any close to where I live. Google found me two stores and I was really excited to go. One was decent, the other inspired me to write this. The saying goes that everything is bigger in Texas. At this store, they took that literally with their prices. One of the first things I did when I got settled in after arriving in San Antonio was check to see if there were any retro game stores I could visit while I was there. There were three stores that came up, but one of them was significantly farther away than the other two, so I decided to just forget about that one. The others were close, though, so one day my fiancée, her mother, her grandmother, her brother, and myself headed out to do a bit of shopping. We hit a Barnes & Noble first before heading to do some potential retro game shopping. Before we left the house, I opened up the list of NES seal and screw variants I'm looking for on my phone so I could be sure it would pull up. For whatever reason, sometimes my list won't open on Google Docs when I'm not on Wi-Fi. That's definitely something I need to get sorted out before the next time I go on a road trip looking for games. The first place we went to was called Game Over Videogames. It was a very nice, clean store with a good selection. They had a lot of NES and SNES games, nothing too mind blowing, but it was a good selection. I opened the tab on my phone with the list and it wouldn't load up. They had a ton of games there that were no doubt seal and screw variants I was looking for, but I couldn't see my list. I tried everything to get it to open, but Google Docs could not retrieve the document. I started stressing out because I'm just standing there on my phone not looking at anything and I'm the only reason we're all even at this store. Eventually I just gave up on it and started browsing from memory. I did find one I knew I didn't have, a five screw Top Gun, and a game I didn't have at all called Rollerblade Racer. We went to the second store which wasn't that far away, and when we got there they were closed. It looked like a really seedy place from the outside, but with stores like these it's what's on the inside that matters. They could have a ton of old games, and from the pictures I saw online of this palace full of propaganda, that seemed to be the case. Well, a few days later I managed to get back to that store and they were open this time. When I walked in, it was a dark and cramped space full of vinyls, but I could see in the back area that there were tons and tons of games along the walls. I made my way back there, and saw exactly how much stuff they had crammed in this tiny space. There were many NES games lined up on the shelves, but they were all behind a counter, so I wouldn't be able to look for seal variants. As I started going over them, I started noticing a lot of games I didn't own at all. More than I have ever seen in one place. When you need less than 60 before you have them all, that's impressive. So I forgot about looking for screw variants at that point and I just began making mental notes of the NES games they had that I didn't. Eventually an older man came over and asked if I needed some help. "I'd like to get some prices, please." Ha ha. "If they're that cheap I'm going to be buying a lot, but I have a feeling they're not." My experience over the next several minutes and online reviews I read later of this place would tell me that I couldn't have been more correct. I stopped having him remove games because I knew the ones I had weren't cheap. They should have been affordable games, but not cheap games. I didn't want him to take a lot of games out of the wall to look up and then me end up not buying anything. But here's where the problem occurred. He didn't look up the games. He just asked the other guy from across the room. The other guy in the store was a long haired man with a loud voice who came across as a know-it-all based off of the conversation I was overhearing him have with another customer that was in the store. He too was not the owner, but a friend of the guy who does. Every game the guy asked him about was quoted at a price that was double or in some cases triple what it usually goes for. 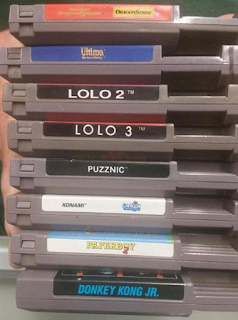 For instance, one of the games in my pile was Adventures of Lolo 3. The price the guy quoted me, now this is cart only mind you, was $120. I just looked it on Price Charting and it says $49.99. Sold eBay listings show the game selling for $40 to $55. Another one I had was Donkey Kong Jr. His quoted price was $80 (unless I wanted Donkey Kong Classics, which would then be $20, he said). Price Charting says Donkey Kong Jr. is $19.99, and sold eBay prices are from $30 to $40. His prices were coming from out of nowhere. He seemed to be really stuck on $80 each for some reason. 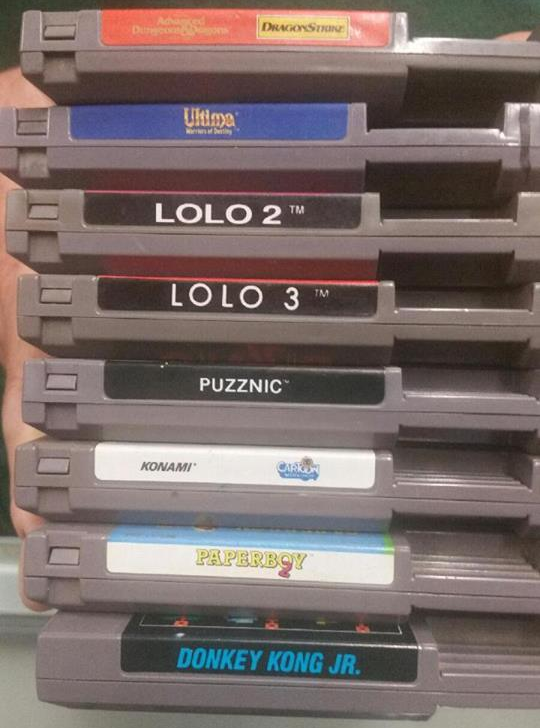 Several of the games were $80, with one being $60 and Lolo 3 being the ridiculous $120. At this point I gave up. His prices were way too high. There was also a copy of Lunar 2 for Sega CD there. I didn't ask how much it cost because I knew it would cost a month's rent. Apparently, from what I then gathered, is that the owner has the final say in what to charge for the games. If the owner is needed to get the prices, that tells me that they just charge whatever they feel like and not actually what they're worth. Any of them could have looked the prices up online if that's their pricing system, so if they need the owner to give the prices himself, then that's a little suspect to me. The owner, by the way, was totally unreachable because he was "in a cave." That's right. The owner, who gives all the prices to the NES games and I assume everything else in the store based off of however he's feeling at the time, is underground in a cave and cannot be reached. Nice way to run a business. Knowing that I wasn't going to be able to afford anything with their pricing scale without taking out a loan, I asked for a simple game that my fiancée is wanting from her childhood. One I thought shouldn't cost that much given it's a greatest hits PlayStation game. "Do you have any copies of Ape Escape?" "No. That one would be about $100 if we did, depending on whether or not it was complete. That's one no one wants to get rid of. The Spyro games, too." So what this store did was run me off. Permanently. They ensured that I would not buy anything from them this time or any other time in the future when I visit Texas. I left empty handed when I had a pile of games I was wanting to buy, but only for what they're worth and not priced by the whims of a madman. The experience with them also led me to writing this, which will surely sting them the most when the three people who visit my site read it. I guess at the end of the day it's their business and they can run it however they want to. I won't be patronizing them, though.